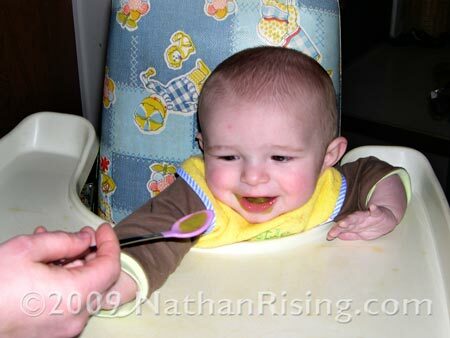 As you know, we recently introduced solids into Nathan’s diet. 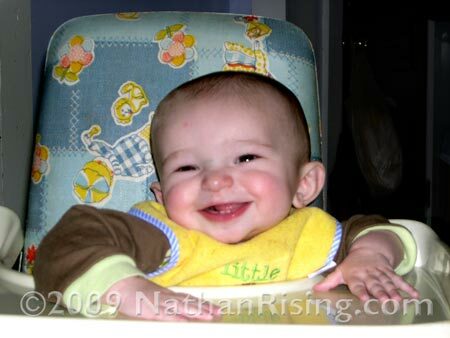 We’re temporarily using Paul’s highchair from when he was a baby, keeping Nathan under supervision at all times, even though Paul’s high chair is in excellent condition. 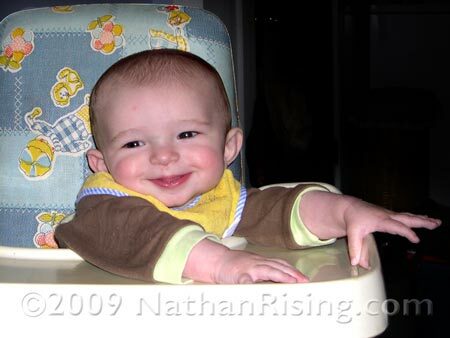 He likes almost all of the foods we’ve given him this far… pears, prunes, carrots, and bananas to name a few. So far, the only food he has adamantly vocalized his distaste for are sweet peas. 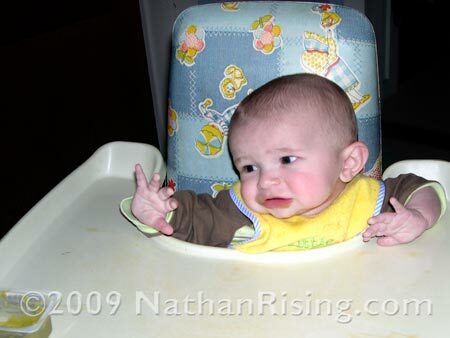 I read that some foods need to be given to baby 10-15 times before the baby decides whether or not he likes it. I don’t know if I can keep giving Nathan sweet peas, however. 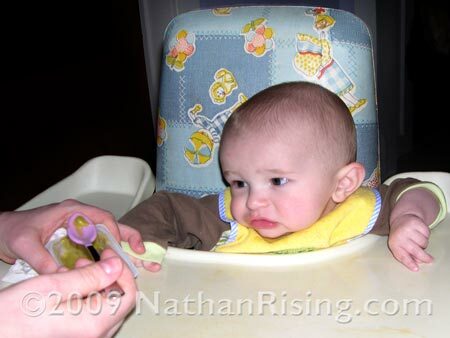 We’ve only offered them a handful of times, and each time, the feeding morphs into this dramatic chain of events that usually results in Nathan arching his back, spitting sweet peas all over the place, and screeching like a wild mountain lion. The first thing that occurs when he spies the container of green mush is his entire demeanor changes. His happy little smile disappears like a sandcastle being washed away by an angry ocean tide. He looks at it like, Oh not again. I can’t be bothered with this substance. I have to give the little guy credit, however; even though he doesn’t like sweet peas, he still gives them another chance, although he makes it clear how reluctant he is. 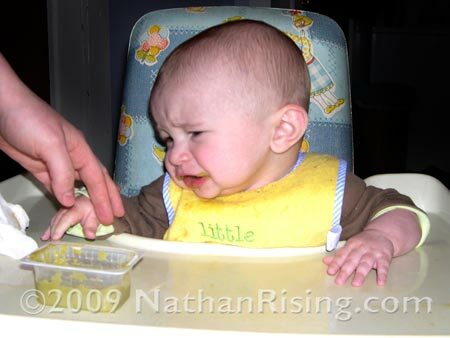 Then he remembers why he didn’t like them in the first place and tries to push the spoon away. I gently persist, making zooming airplane noises and opening my mouth wide, encouraging him to mimic me. I take a little nibble off the spoon and smile idiotically, pretending they are the best food in the world. In response, he smacks at the sweet-pea filled spoon, flicking it into the floor and making a small mess of mashed-up green goo. He decides he’s had more than enough sweet peas and proceeds to engage in a mini-meltdown. I take away the sweet peas and meltdown subsides. I gently wipe his face, which he does not like, and after a few minutes of struggling against the damp cloth, he finally calms down and smiles like he’s about to say, Mission accomplished! And don’t try that again. 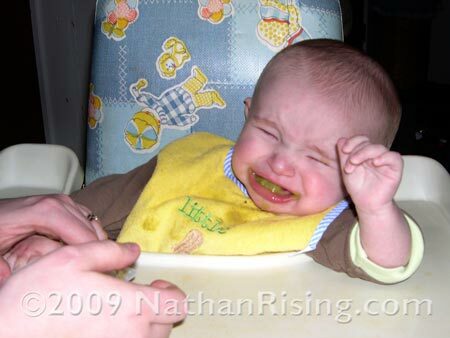 So, how do you get a baby to eat vegetables that they don’t initially care for? I’ll try to feed him more sweet peas in a couple days, but until then, I’m going to enjoy how happy he is when I don’t try to make him eat things he doesn’t like.